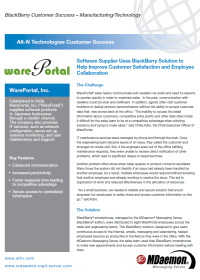 WarePortal has benefited from the deployment of BlackBerry smartphones integrated with the MDaemon Messaging Server. For example, the previous solution used by WarePortal provided separate solutions for email, content filtering, spam filtering, groupware and archiving. The MDaemon Messaging Server, on the other hand, provides all of these services in one cost-effective and easily deployable solution. This decreases the likelyhood of unanswered problems and helps to eliminate duplicated work.